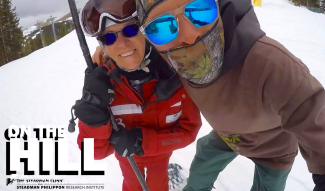 VIDEO: Summit Daily News reporter Joe Moylan skis David’s Run after an eight-inch storm at A-Basin. Arapahoe Basin Ski Area: Reporting 8″ of new snow overnight, 16″ in the last 72 hours, powder/packed powder conditions and an 80″ base. Explore Summit field report: Powder day. Weather: 20 degrees at 9 a.m.
Liftline status: Big line at 9 a.m.
Breakdown: A-Basin is running 8 lifts, providing access to all of its green, blue and black terrain, and 100 percent of its expert terrain. Snowcast: NOAA is calling for snow through Wednesday. Accumulations are expected to be on the low side.